Good Girl Gone Redneck: Pinterest Inspired Lasagna! I started this post a few weeks ago and dropped it. Then I tried again the other night and failed, as Pinterest was flailing and wouldn't let me click through to any links. So what perfect timing to try again as Sarah at My Own Beeswax has a Pinteresting linky up today! I posted once about the Cheesy Chicken Spaghetti Casserole I found on Pinterest, tried and LOVED. You can find that here. It's yum, so if you make it be sure to let me know. I love hearing about people trying stuff I've pinned. Now, I don't know if this counts, because I found a ton of crockpot lasagna recipes on Pinterest, and then I combined them and created my very own. And I pinned it. So, here it is. 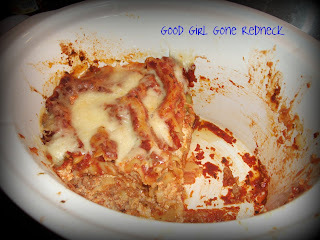 A delicious crockpot lasagna recipe even YOU can make! Brown your ground turkey and add jar sauce to the pan. Cook on low for 5-6 hrs til noodles are soft. With 30 minutes left before serving cover w. 1/2 c shredded mozzarella cheese until melted. As you can tell, it gets gobbled up pretty quickly around here. Love simple creations! Looks so yummy. 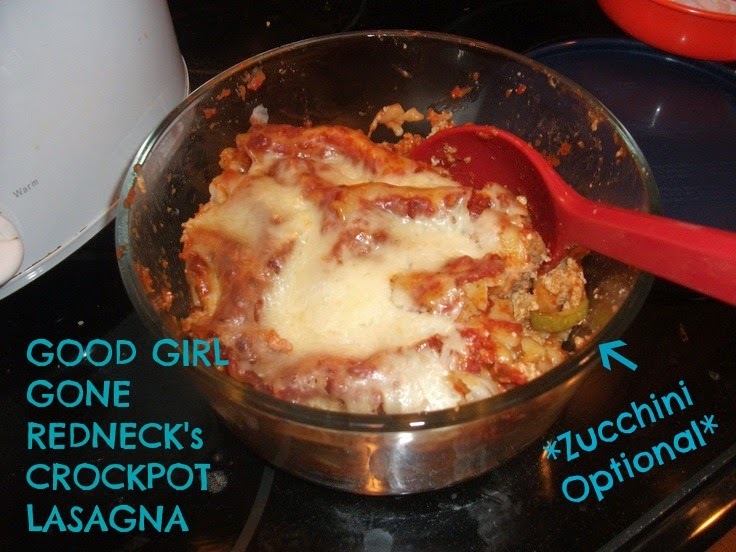 I pinned it ;) Seems to be healthier than a lot of lasagna recipes, too. Bonus! This really looks great! I love the idea of making it in a crockpot. That sounds great. I just started on Pinterest. I'm still undecided about it. I'll have to check out recipes too. Sounds yummy... I'll have to try it! I just had lasagna today too. Making it in the crockpot sounds like a win! Yum! Thanks so much for sharing this- I'm *always* looking for the easy and delish combo! Oy! Totally making this recipe this week. How perfect! Oh yes...this looks easy and awesome. My kind of cooking. You are literally a life saver. I am now in charge of meal plans it's hard to find things I can make easy and fast. Especially with school now. Plus I am big pasta lover. Thank you for sharing. I shall pin it.